Buried in the depths of documents issued in the course of this year are the outlines of the way the Supreme People’s Court (Court) intends to create a corps of judges in which litigants, domestic and foreign, have faith will provide justice. The many measures set out in the 4th Five Year Judicial Reform Plan raise the competency bar for judges. A more litigious and rights conscious public, the increasingly complex economy and greater number of cross-border transactions and interaction, as well as smaller number of judges to hear more cases means that judicial training is an important part of of preparing Chinese judges for the new normal. the September 25 White House press release, in which the United States and China commit to conduct high-level and expert discussions commencing in early 2016 to provide a forum to support and exchange views on judicial reform and identify and evaluate the challenges and strategies in implementing the rule of law. The training plan is linked to the 4th Plenum and 4th Five Year Judicial Reform Plan Outline, the Communist Party Central Committee’s five year training plan for Party cadres (as stated in the plan itself, which means that judges are treated as a type of Party cadre), the Court’s regulations on judicial training, as well the Court’s 2013 policy document on creating a new judicial team (队伍) in the new situation. Team (or work team) derives from “classical” Party terminology (as Stanley Lubman highlighted in an article last year)). The Training Plan stresses ideological, ethical, and professional training, for judges and other judicial personnel. Ideological education is required to be a part of the required training described below, so that judges will comply with Party discipline (a modern day counterpart to Confucian cultivation of virtue) and oppose the osmosis of mistaken Western values (抵制西方错误思想观点的渗透). Front-line judges, particularly those in the basic level courts: continuing legal education, with a minimum of 10 days a year, and in the 2016-2018 period, a new training program is to be implemented, including the heads of people’s tribunals (branches of basic level courts dealing with minor disputes). Training materials are to be compiled by the Court. The second aspect of the training program is to pilot a judicial training program (apparently drawing from the practice in Taiwan and Japan) for new judges in designated areas for judicial reforms (as highlighted in point 50 of the judicial reform plan). 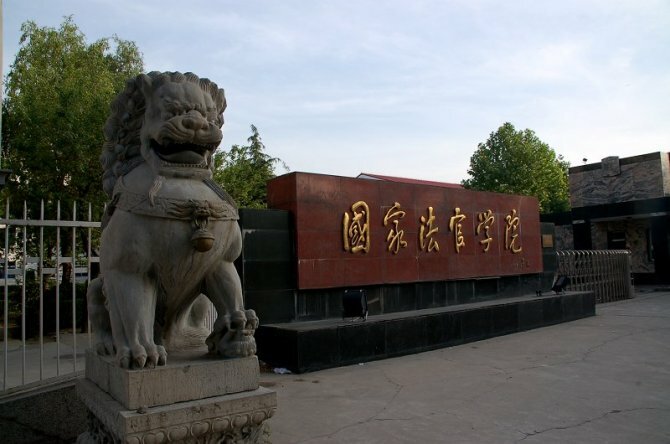 Professionally outstanding judges: the Court is to continue its program of cooperating with certain universities and research institutes to provide master’s and doctoral training (the Chinese University of Political Science and Law seems to be one of the Court’s partners); the National Judges College is to run training programs for outstanding young/middle aged judges for a minimum of one month. Additionally, a corps of outstanding judicial trainers at the provincial level is to be created. The September, 2015 measures to improve foreign-related competence in the judiciary are likely linked to this, as are some of the programmatic outcomes from the US-China initiative on judicial reforms. Judges bilingual in Mongolian, Tibetan, Uygur, Kazakh, Korean, Yi and Zhuang. This target was mentioned in the Fourth Plenum and Fourth Five Year Judicial Reform Plan, and is linked to an arrangement by the State Ethnic Affairs Commission, Organizational Department of the Communist Party Central Committee, and the Supreme People’s Court to train 1500 bilingual judges by 2020. This will also involve more and higher quality translation of legal materials into local languages. Press reports from Uighur and Tibetan areas, for example, describe civil litigants who do not understand Mandarin and find the justice system inaccessible for resolving business disputes, as well as criminal defendants who are unable to understand criminal proceedings, such as a Tibetan who did not understand what a “suspended death sentence” was. In Xinjiang, for example, only 40% of judges described themselves as bilingual. Judicial training is to focus on active and practical methods, including the case method (no less than 30%), moot courts, and other interactive methods. The intellectual influence of exchange and training programs with offshore counterparts is apparent from the more interactive methods required. Previous training programs (often funded by foreign NGOs) have enabled judges from the Supreme People’s Court and other Chinese courts to receive training in China with noted international experts while others have received training outside of (mainland) China. Will this continue under the new normal? This entry was posted in Court Operations, Court Reform, court reforms.